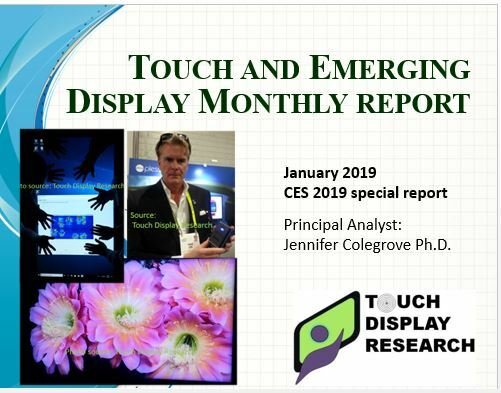 CES 2019 Report: Advanced TV, micro LED, Flexible, and Touch - Touch Display Research, Inc.
Santa Clara, California, January 14, 2019— In the recently published “Touch and Emerging Display Monthly Report,” Touch Display Research Inc., a market research and consulting firm, analyzed the trends at CES 2019: Advanced TV, OLED, Quantum Dot, Micro LED, and Sensors Plus AI (Artificial Intelligence), 8K, flexible display devices, quantum dots, and touch controller ICs. “I just returned from CES 2019 at Las Vegas. It’s my honor to meet some of you in person. CES is the conference where many consumer electronic brands show case their most advanced technologies and the conference that set the trends for the near future. This year’s CES continued several trends from last year, and brought them up to a new level. The CES 2019 key trends include: Advanced TV, OLED, Quantum Dot, Micro LED, and Sensors Plus AI (Artificial Intelligence),” said Dr. Jennifer Colegrove, CEO and Principal Analyst of Touch Display Research Inc., who has authored reports on the touch panel and emerging display industry for over ten years. The January 2019 report is available immediately.